Is it too late to get in on an Indar buy? @ianrwilliams posted for sharing a bottle but I recently messaged Ian after reading the label to not send mine to IL because the storage temperature was something like 40F and above and to not allow the product to go below that temp. I see you’re in Prospect Heights, IL. so the same applies for you. Yes, just PM me either now or closer to March-April and I’ll make sure to put you on the list. Should I also do my peaches even though BR is not currently a problem? Also I have SEVERE BN on my plums … should I Indar them as well? If you all want some I would be glad to work something out. I can get some ? Ounce size bottles and ship it without any great issue. I don’t mind keeping it myself but will be perfectly happy to share. I am sorry I forgot this thread was here. If you are still buying I will still stick to my commitment. I understand the need to split a large container into something smaller. I’m not sure about the legality for doing that. Let let suggest that at a copy of the original label be permanently attached to the smaller container for safety. Please don’t be offended by this recommendation. Edit: Just learned this may not be legal and could result in a big fine! During last night’s pesticide training class the instructor related a incident where a very toxic material (paraquat) had been transferred to another container (Coke bottle) with no label. A grower tasted it but spit it out quickly and washed his mouth thoroughly. Four days later he was dead! No one expects this will ever happen to them but it sometimes does, even to smart, focused people. 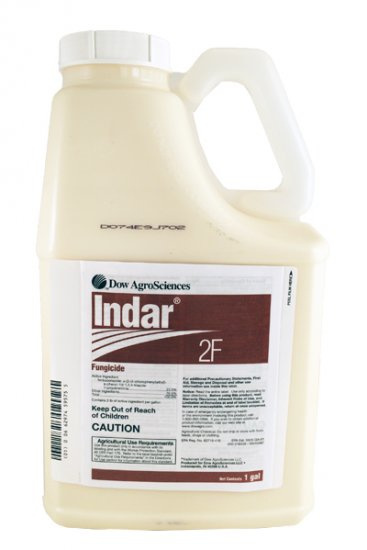 I know comparing Paraquat to Indar not a fair comparison since Paraquat its probably 10,000 times more toxic but It does drive home the need for a permanent legible label on the transfer container. I would be interested in chipping in. Count me in. Let me know where to send the money to, or PayPal address. Excellent point. I can print the label from the PDF on the website and at least put one in each box if not possibly glue it to the bottle. I just ordered it guys. It should be here by Tuesday or Wednesday next week. Please let me know how much you will need and I’ll get a close as possible. Shouldn’t be an issue with regular measuring cups. If you guys can tell me the amounts you want I’ll find out shipping cost. Shouldn’t be much and I’ll figure my price by the ounce. No upcharge or nothing. Just recover my cost. Great bunch here and I will be happy to help. I am definately in on this. Post here or PM me with details. Would also like to find someone willing to group buy Imidan. I understand Imidan usually come in several small sized bags. Id be willing to buy a bag from someone that had extra. I’m in if you still have room on your list. I’ll PM and/or email you. If you want another option to alternate with Indar or propiconazole, maybe Elevate is worth a try. It is supposed to be a new class with low resistance potential. @Drew51 its rated more effective than the Pristine you are using against brown rot, at least in the tables I looked at. I am having enough troubles with rots that I am going to put Elevate in my program to alternate with Indar this coming year. That’s good to know, right now I’m good. My brown rot pressure is not as bad as yours. Nice to know options as the low pressure may change one day. Insect pressure here is outrageous. If you don’t need mind me asking what’s the coverage per oz, or even better, the length for storage? I would hate to order more than I really need and find out that it would be good for next season. When you have time or figure it out put the info in the Spray amounts guide.